Welcome to NetWare News! Since the "demise" of NetWare (Novell is no longer developing the platform), publishers are no longer interested in backing the sharing of information about the venerable network/server operating system. We hope to hold the final obituary at bay just a tad longer with these tidbits of information, and links to helpful sites and tools, for those who just can't give up the all-time champion of networking systems. Back in the day, when Ethernet was only 10 mbps and Arcnet was all the rage for NetWare networks, Network Computing was THE magazine to read. All of the big names in NetWare wrote for the mag at one time or another and none of it was fluff - it was always relevant. Sadly, NC is no more. At least the paper copy won't hit my mailbox every month any longer. In these days of instant news, instant analysis and instant gratification, the monthly magazine - especially the monthly tech magazine - no longer seems relevant. Just another dinosaur headed for the tar pit. But we should pause and remember. We should remember the pioneering efforts of those who went before. NC lingers on in an abbreviated on-line version, some of it's regular features have moved to Information Week, but it won't be the same. Still, it's to the credit of editor Art Wittmann and his crew that they held out this long in the face of the decimation of the technology press. Au revoir, NC, arriverderci, auf weidersehen. Well, it's finally happened. NetWare is now virtual and Linux based. According to a story in The INQUIRER, Open Enterprise Server (OES) 2 was released yesterday "...has the NetWare operating system kernel, NetWare 6.5 SP7, running on top of the Xen hypervisor." To say that NetWare is now merely a shadow of its former self is both trite, and true. Just released on the Cool Solutions site is NLM Inventory Tool 4.0, "a process to import the server Config.txt file data using Microsoft Word and Microsoft Access 2000." Something to add to your toolkit to help you better manage the server environment. Just another fine tool from Chris Premo. 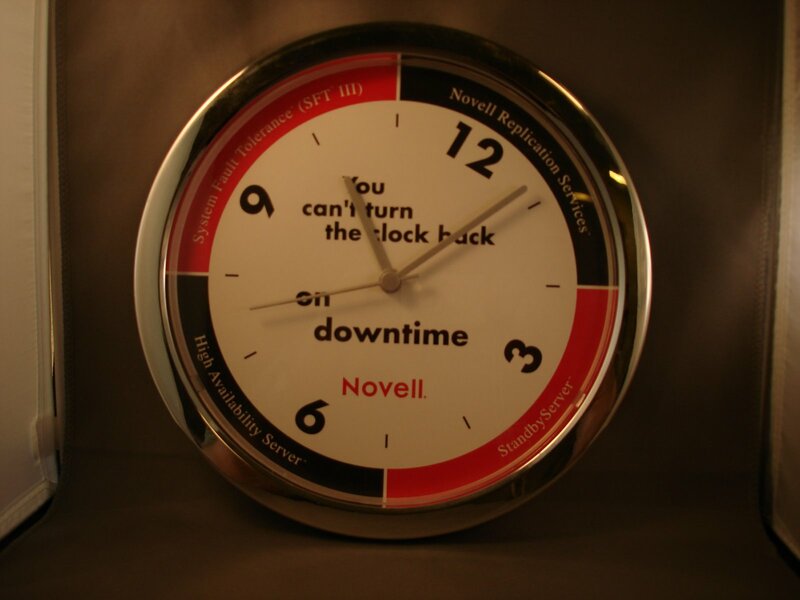 The rolling backpack sold on eBay, so here's the next item I'm offering up: it's an advertising premium, a Novell NetWare Clock from the late 90's. Now wouldn't that look nice in your server room? Right now, there's a genuine BrainShare rolling Compu-Backpack , but it won't be there for long! 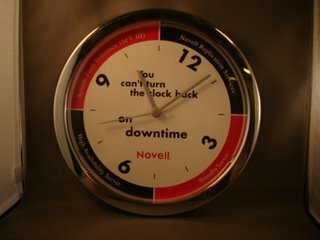 Tech Republic is running a poll: "Are you running any classic Novell products on your network?" Here's your chance to let the world know that NetWare is your choice! "the fact that NetWare sales are not plummeting, as they have been doing for many years, is probably equally significant and worthy of some attention." "If aggregate NetWare and OES sales declines continue to shrink, as they have done in the past two quarters, and if Linux sales continue to grow, as they have particularly since Novell's distribution deal with Microsoft, then Novell could actually end up being a profitable company again..."